If you talk to people who knew Special Prosecutor Robert Mueller III when he was a young man, you will hear a lot of what you already know. He was hard-working, lacrosse playing, straight arrow who served in the U.S. Marines between studying in the privileged precincts of Princeton and University of Virginia Law School. You will also hear some finer details. Friends and faculty describe a temperamentally conservative young man who was comfortable with liberal ideas. Mueller was more methodical than ingenious, his classmate say, a plodder not a plotter. “Not among Princeton’s best and brightest,” said one otherwise admiring alumnus. And he possessed a self-effacing quality that resulted in more than a few saying their memories of him were dim. Mueller is now reportedly in the last stages of his investigation of President Trump and his entourage for possible collusion with Russian state agents. His final report (if the recalcitrant Attorney General William Barr makes it public) will set the stage for the last two years of President Trump’s first term. Whatever Mueller finds, his formative years are prologue to the fury to come. 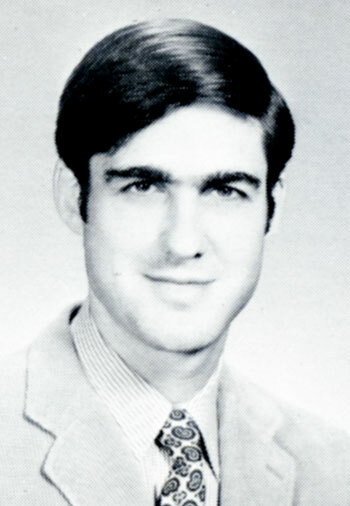 Mueller’s intellectual formation took shape in his undergraduate thesis for the Department of Politics, submitted in April 1966. His topic: international law and apartheid. 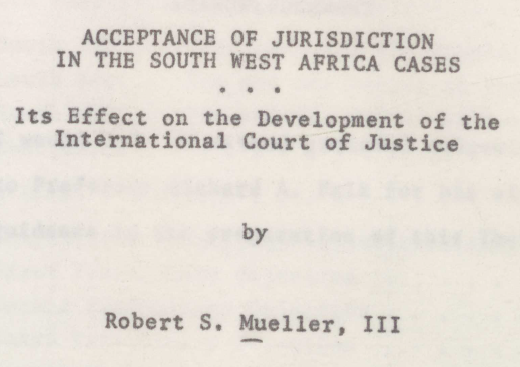 In 121 pages of dry prose he analyzed the 1962 decision of the International Court of Justice to accept jurisdiction for a case challenging South Africa’s imposition of apartheid in the territory known as Southwest Africa, now the independent nation of Namibia. Mueller thanked his thesis adviser Richard Falk, a leftist scholar for his “stimulating guidance.” But when a reporter from the Chronicle of Higher Education called Falk last year to ask him about Mueller’s thesis, he initially did not remember its author. Falk noted the similarity between the situation facing the ICJ in 1962 and the special prosecutor today. “Despite his antipathy to apartheid, Mueller clearly believed that the rejectionists had the better of the narrow legal arguments. Yet, as suggested, this did not resolve the issue for Mueller. He set forth an argument showing that South Africa had pursued an oppressive set of policies and practices that were imposed on the native population in draconian fashion. How Mueller balances his legal findings about Trump and Co. with “the larger purposes of the law” will define his report on the president and the Russians. After graduation, Mueller enlisted in the Marine Corps and served two tours in Vietnam. He returned to enroll in UVA Law School in 1970. He joined the law review and received his degree in 1973. His style was unobtrusive. If history is any guide, Mueller’s forthcoming Trump-Russia report will be long on facts, process and rule of law, short on personality and anything but the most pedestrian politics. But unlike the young man, it will not be forgettable. Mr. McCabe seems at this point to have his ducks in a row. If his claims stand up to scrutiny. He claims he as well at others at FBI were so concerned that Trump did and does pose a serious threat to national security, they felt they had to act. What the law needs is a defense from Trump for his actions. He must explain his actions or take the 5th. Something very telling did not happen when Mike Pence spoke in Warsaw. He showed a picture of Trump in his beautiful “CLOTHING”, and everyone was quick to realize the “Emperor” appeared to be as naked as a “Jail Bird”! Not that much has changed since 1968 when it comes to the rest of the world and how they view the US currently. The whole world is watching and shaking their heads while American Evangelical Frogs sit in their pans of water on stoves waiting for the water to boil. .